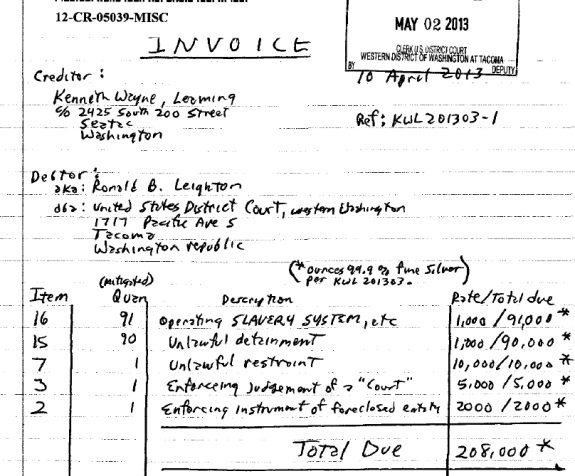 EDITOR’S NOTE: This story was updated at 9:37 a.m. EDT on May 13 and again on May 17 at 2:24 p.m. to reflect that Kenneth Wayne Leaming is demanding payment from a federal judge in ounces of silver, not dollars . . .
Devitoe Farmer, the purported Tennessee “sovereign citizen” indicted last year on charges of stealing government property in a “quit-claims” caper, has pleaded guilty to three counts of theft. Meanwhile, Kenneth Wayne Leaming — the AdSurfDaily figure and purported “sovereign citizen” in Washington state jailed after convictions for possessing firearms illegally and filing bogus claims against government officials involved in the prosecution of the ASD Ponzi scheme — now has sent a bill to the federal judge who presided over his criminal trial. The bill demands payment of 208,000 ounces of “99.9% fine silver” from the judge. First, the Farmer story . . .
“In the Mid-South, we have witnessed first-hand the potential threat posed by those claiming to be sovereign citizens,” said U.S. Attorney Edward L. Stanton III of the Western District of Tennessee. Farmer, 46, apparently decided he wanted to own homes — and apparently came up with a paperwork confection in which he transferred three properties owned by the U.S. Department of Housing and Urban Development to himself. According to an indictment filed on March 21, 2012, and facts of the case revealed during the plea hearing, Farmer took possession of three HUD-owned properties in the city of Memphis during February and April of 2011. His scheme was discovered when employees with a property management firm contracted by HUD to care for the properties discovered that Farmer had filed quit claim deeds to himself with the Shelby County Register of Deeds Office on the properties and placed tenants in them. HUD-contracted real estate agents also noticed that “for sale” signs had been removed from the properties and that locks had been changed. One of the properties was rented to an individual, who supplied investigators with copies of the lease agreement made with Farmer. Another property was occupied by a relative of Farmer. When asked by Memphis Police Department officers for proof of his ownership of the properties, Farmer presented documents declaring that he was a sovereign citizen. There have been some very strange events in the Memphis region, including the bizarre case of Tabitha Gentry. Gentry is accused of licensing herself to occupy an East Memphis mansion she did not own. Leaming, 57, was found guilty in the Western District of Washington earlier this year of possessing firearms as a convicted felon and filing bogus liens for billions of dollars against public officials involved in the prosecution of the AdSurfDaily Ponzi scheme. One of the targets was a U.S. Secret Service agent. Both before and after his conviction, Leaming filed blizzards of paperwork. Among his most recent filings is a claim that U.S. District Judge Ronald B. Leighton owes him 208,000 ounces of fine silver. Leighton presided over Leaming’s criminal trial. AdSurfSaily figure and purported “sovereign citizen” Kenneth Wayne Leaming now claims a federal judge owes him 208,000 ounces of fine silver. Source: Federal court files.